Dens invaginatus (DI or dens in dente) and Talons cusp or dens evaginatus are relatively rare developmental anomalies which affect the shape of teeth. DI is a deep surface invagination of the crown or root which is commonly detected on routine radiographic examination. Talon cusp is an additional cusp that projects predominately from the lingual surface of anterior teeth. These anomalies most commonly may be observed in the maxillary lateral tooth. Concurrently, the coexistence of these two anomalies in a single tooth is considered extremely rare. However, still in literature, there are a few reports cases available. This article is a case report of Talons cusp with DI involving maxillary lateral incisors in a 16-year-old patient. “Dens in dente” is a developmental malformation incident due to the in folding of enamel and dentin or accentuation of the lingual pit of an incisor before calcification sets in. The etiology of dens invaginatus (DI) malformation is controversial and remains unclear. Over the past decades, several theories have been proposed to explain the etiology of dental coronal invaginations. Kronfeld (1934) suggested that the invagination results from a focal failure of growth of the internal enamel epithelium, external forces exerted on tooth germ. The rapid and aggressive proliferation of a part of the internal enamel epithelium (Ruston 1937), Atkinson (1943) suggested that the problem was the result of external forces exerting an effect on the tooth germ. Due to distortion and protrusion of the enamel organ during tooth development (Oehlers 1957), absence of signaling molecules for morphogenesis and therefore, genetic factors are involved (Grahnen et al., 1959, Casamassimo et al., 1978) and most probably the maxillary lateral incisor is most commonly affected and one of the reasons being the external forces applied on the lateral incisor tooth bud by the developing central incisor or canine which develops 6 months before. Several authors have proposed classifications systems for DI, also known as dens in dente, dentoid in dente, invaginated odontome, or dilated composite odontome, but the most commonly used system is proposed by Oehlers. This system classifies the invagination into three types, based on the extent of the invaginated dental tissues and communication with the periodontal or periapical tissues. Type I is an enamel-lined minor invagination that remains in the crown, not extending beyond the cementoenamel junction (CEJ). Type II is an enamel-lined invagination that goes beyond the CEJ forming a blind sac inside the root, and it may or may not communicate with the dental pulp. Type IIIa is an invagination that extends through the root and opens laterally in the periodontal tissues. Type IIIb is an invagination that extends through the root and opens apically in the periapical tissues. These teeth may present with unusually shaped crowns often described as dilated, peg-shaped, or barrel-shaped. Exaggerated palatal cingula, talon cusps (TCs), notching of the incisal edges with palatal grooving, or a deep foramen cecum may also be present. The present case report involves Type II invagination of enamel into dentine with the presence of talons cusp. TCs have been seen in patients with Mohr, Rubinstein Taybi and Sturge – Weber syndrome More Detailss, Ellis van Creveld syndrome. The clinical problems associated with the presence of TCs include stagnation of the food, caries, periapical lesions, irritation of tongue during speech and mastication, other soft-tissue irritation, compromised esthetics, occlusal interference which may lead to accidental cusp fracture, displacement of the affected tooth, temporomandibular joint pain, and periodontal problems due to excessive occlusal force. This type of anomaly may cause occlusal and esthetic impairments and facilitate the development of caries in the area of the developmental grooves. The prevalence of this anomaly ranges from 0.3% to 12%. Preservation of the tooth structure is also one of the goals of the endodontic treatment. Although the dens removal may facilitate the proper root canal disinfection, that may result in compromised tooth structure. The aim of this case report is to present the nonsurgical treatment of Type II dens invagination. A 15-year-old male patient reported to the department with difficulty in chewing and discomfort in anterior tooth region. On clinical examination revealed tooth was asymptomatic; pulp vitality tests revealed that there was delayed response in relation to 12. While positive response in relation to 22. A diagnosis of asymptomatic chronic apical periodontitis with irreversible pulpitis was made in relation to 12. Hence, conventional root canal therapy was planned in relation to 12. Root canal therapy without local anesthesia and under rubber dam (Hygenic dental dam, Coltene whaldent Switzerland) isolation was initiated. Access opening with tapered safe-ended endoacess diamond point (Maillefer-Dentisply, Baillagues, Switzerland) enlarged cavity was done to provide better accessability and visualization. Initial negotiation of the root canals was performed with a K-file ISO 15. Using a DG16 endodontic explorer (Hu-Friedy, Germany) and a size 15 K file (Mani Inc, Tochigi, Japan), two orifices were identified [Figure 1]g. Working length determination was done with apex locator and radiographically, and it was noted that there was weins Type II (2-1) configuration in relation to 12 with oehlers Type II dens in dente in relation to 12 and 22 [Figure 2], [Figure 1]g and [Figure 1]h. Although the coronal enlargement with gates glidden drills. The glide path preparation done with 15k, 20k, 30k (Mani Inc, Tochigi, Japan) file. The relocation of canal orifices allowed straight-line access in both canals. Initially, it was planned not to remove much dens; however, for proper visualization sufficient removal of dens was done. Biomechanical preparation was done with 6% protaper rotary universal system (Densply mallifier) with corresponding shaping and finishing files. Copious irrigation with 5.25% sodium hypochlorite was done during the first visit followed by normal saline. Canal dried using absorbent paper points. During second visit, patient reported with slight pain (Visual Analog Scale-2), possibly it could be due to complex anatomy of tooth and insufficient removal of dens. 2% chlorhexidine irrigation was done and canal dried with absorbent paper points. Calcium hydroxide dressing was given during second visit. Canal was filled with AH-26 (De Trey Densply Kostanz, Germany). Obturation with 6% gutta-percha with hybrid condensation and cold lateral compaction [Figure 1]j was done. Its maxillary left lateral incisor (22) reshaping in obturation [Figure 1]g and [Figure 1]i and contouring of talons cusp done followed by caries excavation and postendodontic restoration with glass ionomer filling was given [Figure 1]l.
Access opening showing two orifices, working length determination with IOPA showing Weins 2-1 configuration and follow-up after 6 months [Figure 1]k.
The exact etiology of TC and DI is still not well understood. Simultaneous occurrence of these two anomalies in a single tooth suggests common etiological factor. Knowledge of complex root canal anatomy may help in elimination of possible bacterial products. Dens in dente is one of the complex morphologies in crown which leads difficulty in irrigation, disinfection, and obturation of root canal system. Oehlers et al. have given different types of DI. Each configuration require different treatment approaches. A good biomechanical shaping followed by maximum cleaning, optimum irrigant interaction with the root canal dentin, and a good coronal seal is the key to obtaining a successful treatment outcome. Due to the enamel invagination, the DI filling has a wide and bulky cavity, requiring an obturation with filling material. The present case compaction was done using hybrid mode of condensation with cold lateral condensation using AH 26 Resin Sealer (De Trey Densply Germany). However, the use of thermoplasticizing techniques, backfill techniques with elemental obturation system (Sybron endo), can facilitate the procedure and provide a more efficient sealing. Hegde et al., A case reported with dens in dente with constant pain and draining sinus tract and it was managed with minimal invasive approach and with intermittent calcium hydroxide dressing and evaluated at sequencial visits at 3, 6, 9, and 12 months accidental cusp fracture, compromised esthetics, irritation to the tongue during speech and mastication. Type II dens invagination which is characterized by extensive invagination of enamel which may reaches across the CEJ [Figure 2], [Figure 1]a, [Figure 1]c and [Figure 1]f. Specifically, in the morphodifferentiation step, the teeth can be affected by the TC, which can be confused with other dental anomalies if a very thorough clinical and periapical examination is not performed. Dens evaginatus (TC) [Figure 1]b and [Figure 1]f is a developmental malformation characterised by the presence of an extra cusp that takes the form of a tubercle arising from the occlusal or the lingual surface of the tooth. Furthermore, developmental grooves on the TC [Figure 1]e and [Figure 1]f trap plaque and increase susceptibility to caries and pulpal involvement.,, The present case reported with complaint of occlusal interferences [Figure 1]d and [Figure 1]e in anterior teeth. Hattab et al., classified TCs into three types: (a) Type I (true talon) is a morphologically well delineated additional cusp that prominently projects from the palatal surface of a primary or permanent anterior tooth and extends at least half the distance from the CEJ to the incisal edge. (b) Type II (semi talon) is an additional cusp of 1 mm or more that extends less than half the distance from the CEJ to the incisal edge and blends with the palatal surface or stands away from the crown. (c) Type III (trace talon) is an enlarged or prominent cingulum with variations such as conical, bifid, or tubercle like. Certain investigations provided conflicting results with histological, clinical, microscopical, and radiographical examinations. The structure of the dentine surrounding the invagination has also been reported as being irregular with connective tissue inclusions and communications toward the pulp (Atkinson 1943, Omnell et al. 1960, Vincent Townend 1974, Beynon 1982, Piatelli and Trisi 1993). Hattab et al. in their study reported a male to female ratio of 47:26 among 73 cases reported in the literature. Most reported cases of TC are located in the permanent dentition. Vikrant et al. reported the Coexistence of two TCs and two DI in a single tooth with associated radicular cyst, and use of platelet rich fibrin in the management of associated radicular cyst. The present case report with bilateral talons cusp in relation to 12 and 22 with complex root canal anatomy and configuration easily identified by occlusal view and intraoral periapical radiography. Cone beam computed tomography (CBCT) was the limitation in this case report and presently CBCT could have been a better alternative in diagnosis and treatment planning of dens in dente. Knowledge of root canal morphology and complex anatomy of tooth structure with DI is essential for favourable outcome of root canal therapy. Recent advances such as CBCT, with different radiographic projection and Dental operating microscope could help to identify the configuration and complex anatomy of root structure. Diagnosis and preventive approach may helps in minimizing future complications in such cases. The authors would like to acknowldege my other department collegue Dr. Abdul Haleem (periodontics kvgdc sullia) Dr. Chandrima (Department Orthodontics) for throughout the case work carried out. 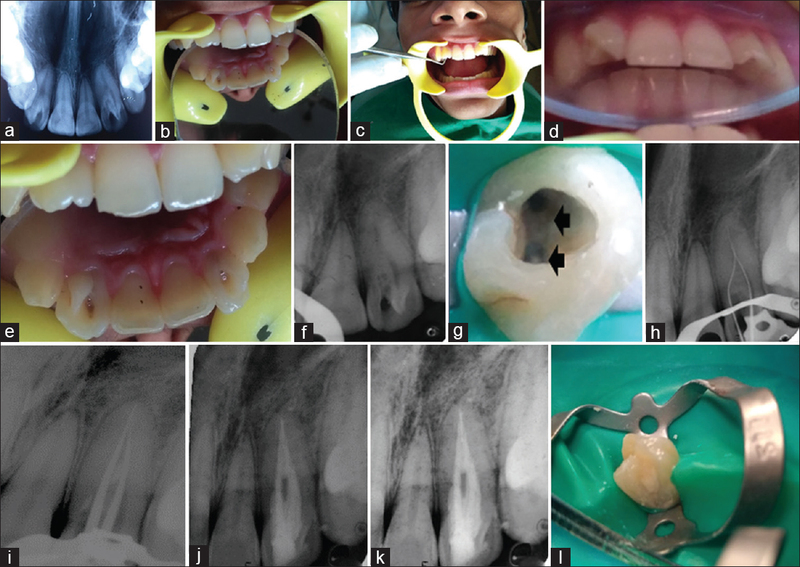 Hegde V, Morawala A, Gupta A, Khandwawala N. Dens in dente: A minimally invasive nonsurgical approach! J Conserv Dent 2016;19:487-9. Martins JN, da Costa RP, Anderson C, Quaresma SA, Corte-Real LS, Monroe AD, et al. Endodontic management of dens invaginatus Type IIIb: Case series. Eur J Dent 2016;10:561-5. Thakur S, Thakur NS, Bramta M, Gupta M. Dens invagination: A review of literature and report of two cases. J Nat Sci Biol Med 2014;5:218-21. Dash JK, Sahoo PK, Das SN. Talon cusp associated with other dental anomalies: A case report. Int J Paediatr Dent 2004;14:295-300. Vardhan TH, Shanmugam S. Dens evaginatus and dens invaginatus in all maxillary incisors: Report of a case. Quintessence Int 2010;41:105-7. Güngör HC, Altay N, Kaymaz FF. Pulpal tissue in bilateral talon cusps of primary central incisors: Report of a case. Oral Surg Oral Med Oral Pathol Oral Radiol Endod 2000;89:231-5. Kasat VO, Singh M, Saluja H, Ladda R. Coexistence of two talon cusps and two dens invaginatus in a single tooth with associated radicular cyst – A case report and review of literature. J Clin Exp Dent 2014;6:e430-4. Hattab FN, Yassin OM, al-Nimri KS. Talon cusp – Clinical significance and management: Case reports. Quintessence Int 1995;26:115-20. Dankner E, Harari D, Rotstein I. Dens evaginatus of anterior teeth. Literature review and radiographic survey of 15,000 teeth. Oral Surg Oral Med Oral Pathol Oral Radiol Endod 1996;81:472-5. Nu Nu Lwin H, Phyo Kyaw P, Wai Yan Myint Thu S. Coexistence of true talon cusp and double dens invaginatus in a single tooth: A rare case report and review of the literature. Clin Case Rep 2017;5:2017-21.